We held a delightful Dignity Tea Party for residents and relatives and all the special china was dusted and put out for all to enjoy. Windmill worked hard to involved many community links as part of Dignity Year of Community. We were privileged to have the event opened by Attleborough Town Mayor, Jeremy Burton. Pippa Hardie from Rosedale Funeral Directors brought Memory Boxes and Morrisons' Community Champion, Emily Blanchflower, brought along a large hamper full of donated goodies. Sixth form students visited from Wymondham High School, who volunteer on a regular basis. We send a huge sincere thank you to all who supported our home and event. 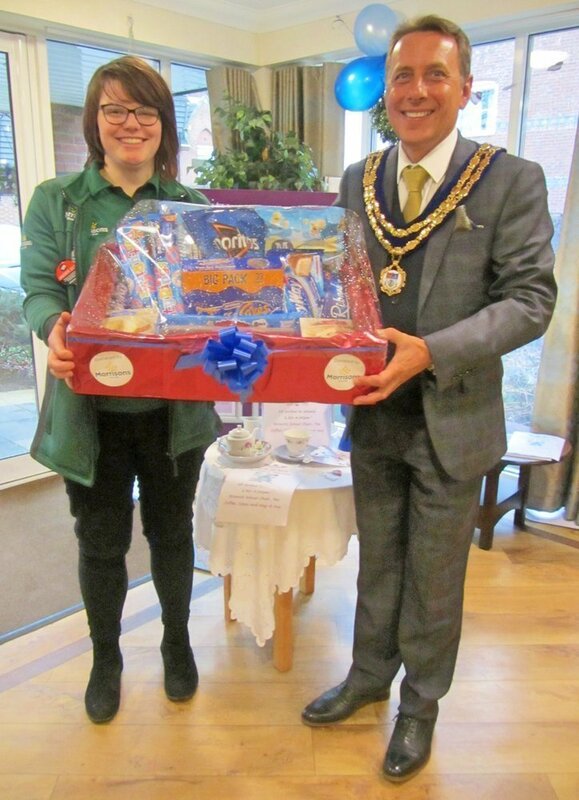 Morrisons' Community Champion, donating a hamper. Memory boxes donated by Rosedale Funeral Directors. Dignity displays throughout the home.